Hey everyone! You ready to chill out? 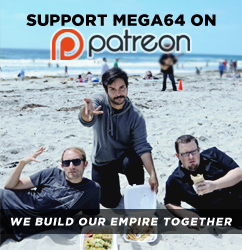 Grab some mellows to prepare for a sweet Bonfire with the Mega64 Boyz! In this episode: We talk Rocco and Kevins Soul Calibur XI experience, Classic movies and TV shows, all while hanging out at the Beautiful San Diego Bay! Check it out! Click here for the audio version! That's all for now! See you next week for PODCAST 500!!!! !